Wow! I could look at the man making burrata for hours. 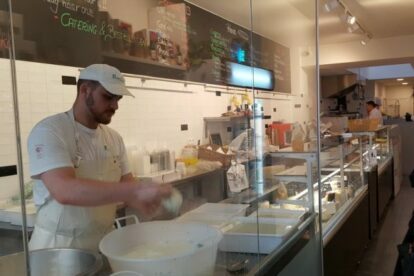 He stands in the shop window and without losing concentration he fills a little pouch of mozzarella with a mix of fresh cream and minced mozzarella, ties it carefully up with a green straw and starts with the next one. I had never bought cheese that fresh before! The fresher, the better! Without using preservatives, burrata has to be eaten within the next two or three days. No problem for me: by only adding some rucola, sliced cherry tomatoes and olive oil, I can serve a fancy appetizer.